With the holidays fast approaching, some of you may be wondering what gifts you can give the children in your life that will help them be better prepared. 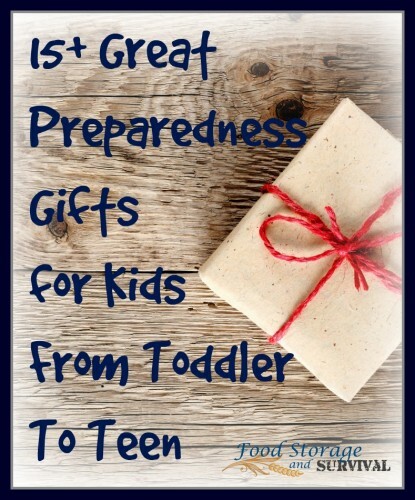 I’ve thought the same thing every Christmas and birthday for my own kids, so here are some age specific gift ideas for the children (or grandchildren) that will add to their preparedness level–sometimes without them even knowing that’s what it’s for! And there’s no need to wait until the end of the world to use these gifts–most of them are just plain useful and fun to have around every day! To avoid repetition, each age could also includes any of the gift ideas for the younger age groups–just gear it up to the age and maturity level of the child you are getting it for. Age 0-3; babies and toddlers. Put together a 72 hour emergency kit for them. At this age they aren’t able to do much for their own survival so even though the gift is to them, it’s more for the parents to be able to provide for their little one in the event of an emergency. flashlights, headlamps, or other light sources. With little people you can never have enough of these, plus they’re fun at bed time or when you’re camping! Watch out for quality–sometimes the “cute” kid flashlights really stink at putting out light or battery life. There are some headlamps made specifically for kids that have a timed shut-off so the batteries don’t all get used the first night when they forget to turn it off. Gardening supplies. 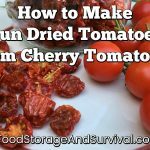 Get them a few packets of seeds and some hand tools and plant a garden together in the spring! Books they can read themselves. Here are a couple of lists to get you started at Barnes and Noble, and from the University of Wisconsin. My son also really enjoyed Les Stroud’s Will to Live. Pocket knife. Every kid is different and will be ready for a knife at a slightly different age, but most will hit this maturity level between 8 and 12. BB gun or 22 rifle. Like the knife only more important, this one is your call at what age you give them a gun. You know your kids and their maturity levels. Make sure they understand safety and are supervised when they’re using it. Our kids had BB guns younger than 8, but only get to use them with an adult around. Small tent or other camping gear. Even if you aren’t going to take them camping, backyard or living room camp outs can be a great learning experience. In addition, many boys and girls are involved in scouts at this age and camping gear of your own is pretty cool. First aid gear. This is one that would need to go to a kid who is capable of leaving it alone until needed. But even if it’s a small kit so they can put their own bandages on their scrapes, they’ll be learning how to perform simple first aid. Sewing supplies. Girls and boys can learn to sew and make some simple projects like a pillowcase or a drawstring bag between ages 8 and 12. If they don’t have access to a sewing machine, a cross stitch or embroidery kit would be a great way to get them comfortable with a needle and thread. Fire starting gear. Camp outs become more serious at this age, especially if your child is involved in scouts. Again, you are the judge of when a potentially damaging item should be given as a gift to a child. Some waterproof matches or a fire striker along with a lesson on using them would be a great gift for any teen interested in the outdoors. Multi-Tool. Like a pocket knife on steroids, a multi-tool like a Leatherman has multiple uses in everyday life plus is super handy in an emergency. Stove. Especially if your child enjoys camping, a stove suited to backpacking or cooking outdoors would make a great gift. 2 way radios. Admittedly these are fun for the 3-8 crowd on up, not just teens. I’d keep them in my possession for the younger ages, but let a teenager own his or her own set. At this age, your child should be heading out of the house in the near future–check out my top 10 graduation gift ideas for new adults. You could also get them their own canning supplies, more advanced gardening gear, or some hand tools. Preparedness gifts for kids are a great way to get some survival gear into their possession. Even if one or both parents are not on the survival wagon, you can still get the kids one of these gifts and it could end up helping the whole family! Backpack with emergency stuff in it like emergency blankets, waterproof matches, candles, charcloth and more. I did car kits for all my grown up siblings one year. They’re so easy to put together and then give them a list of things they can add on their own (I had to ship mine, so they got to add their own water, some needed diapers that I didn’t have, etc.). Great ideas! Great information.This can come in help whenever needed.